Immersing yourself 360° means sharing an experience. A story becomes interactive, with the reader as its protagonist. Taking the 5 Ws of the VR/AR Association as a starting point, the workshop looks at useful strategies, platforms and techniques for enriching your website and/or blog with the creation of a personalized virtual tour. A practical workshop to get to grips with building a storyboard, using a 360° camera and editing in Google Tour Creator and, step by step, grasping the elements that make up a narrative. A personalised virtual tour is, after all, a digital narrative, an experience which, when integrated into various multimedia contents (text, audio, video, pdf, etc. ), can prove particularly useful from a teaching and business perspective. The workshop is aimed at teachers, social media managers, professionals and students looking to try out platforms and new forms of storytelling. The teacher Simonetta Pozzi is a social media marketing and corporate storytelling consultant and coach (in particular in narrative tools and platforms). After accruing considerable corporate experience in the role of PM and coach at Corporate University, she worked on internal organisational storytelling projects for national banking institutions and specialised in fashion and food storytelling for national and international companies with a focus on VR storytelling and AR. 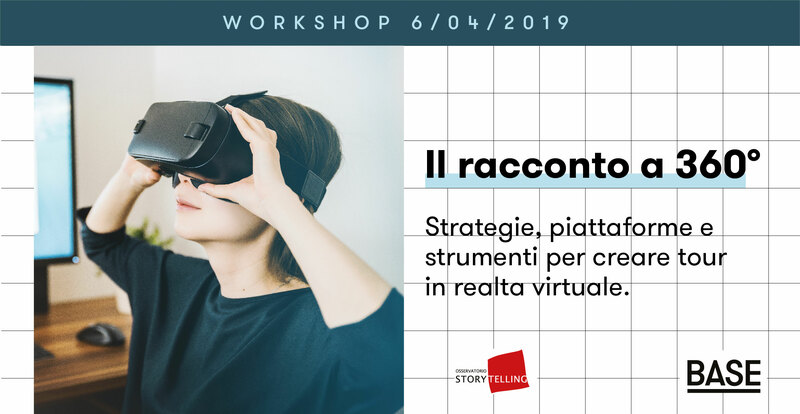 She is a member of the AIF Piemonte (Associazione italiana formatori) Directive and is a professional coach as well as a practising member of the Osservatorio di Storytelling. Chiming perfectly with BASE’s identity, the partnership with Ventura Projects - synonymous with experimentation and innovative ideas on the design scene - will bring the Ventura Future project to the Ex-Ansaldo complex. Covering 3,500 square metres spread over two floors, this is a chance to discover the best design talents from all over the world, featuring projects from the top international design academies and universities, and highly creative studios and brands, for a glimpse of the new frontiers in contemporary design. The exhibition project will also involve casaBASE, BASE Milano’s design hostel / artists’ residence, which will become a guesthouse for some of the designers taking part, as well as a place for them to work on, display, and present their projects to the public. Another central point of Design Week at BASE will be the portineria at the entrance to the ex-Ansaldo complex, set to be transformed into a Design Confessional, created in collaboration with Ventura Projects. The BASE portineria, which was presented at last year’s Fuorisalone as a prototype of urban regeneration and has since become a daily information hub for the city and the ex-Ansaldo community, will turn into a full-on confessional dedicated to design, a place in which to ask all those unanswered questions and seek advice from a few distinguished “high priests” of design, some of the most influential figures in the industry. The main issues: urban solutions, manufacturing 4.0 and the designer-industry relationship. The project was launched with the aim of establishing a path dedicated to the new culture of learning in order to accrue knowledge and know-how capable of responding to the requirements and changes at play in the creative sector. The confessionals will be realised alongside the Officina Grafica (graphics workshop) at Super – Scuola Superiore d’Arte Applicata del Castello Sforzesco. Future and learning are the overarching themes for Fuorisalone in 2019. In addition to the collaboration with Ventura Projects, BASE is presenting an exhibition entitled Un-Learn / Re-Learn. A de-instructional round up of installations and experiences designed by an array of different yet complementary thinkers, artists, innovators and designers for an interactive itinerary packed with questions, installations, talks, and experiences created by Italo Rota with Marco Cadioli, Salottobuono, Cittadellarte - Fondazione Pistoletto, Stefano Mirti and Super - Scuola Superiore d'Arte Applicata del Castello Sforzesco, to name just a few. UN-LEARN / RE-LEARN. A shape-shifting exhibition. By day providing an opportunity to delve into the transformations presented and ponder the questions posed by the designers on show, making way for unexpected perspectives and connections. At dusk there will be time to unwind, allow ideas to settle, make space for discussion and debate, and call into question everything that has so far been learnt and unlearnt. To top off the experience there will also be a programme made up of conversations, talks and workshops to invite interaction with the public. In the evening the space will open up, with music filling BASE’s covered piazza and informal networking sessions getting underway. In addition to Un-Learn / Re-Learn and the Ventura Future exhibition, BASE will present two prototypes to the public: the Design Confession and Officina BASE. Info 9 - 14 April Tickets available online at Mailticket. There is an entry fee of 5 euros which provides access to the Ventura Future and BASE exhibitions, as well as the evening events throughout Milano Design Week, from 9 to 14 April. Why is there an entry fee? Press preview: Monday 8 April from 10am to 7pm Opening hours - Exhibition spaces: Tuesday 9 April: 9.30am – 8pm Wednesday 10 April: 9.30am – 10pm Thursday 11, Friday 12 and Saturday 13 April: 9.30am – 8pm Sunday 14 April: 9.30am – 6pm With a musical line-up to follow in the evenings, curated by BASE Milano. In the courtyard from 8pm to 1am: DJ set with a crescendo of ambient, new world, drone, house and tribal. Inside BASE Milano’s industrial spaces, a huge sound system pumping out bass music and techno. LINE UP DAY BY DAY: Tuesday 9/04 COURTYARD 8-11pm Iacopo Vocci 11pm-1am Rishi Dissidance Wednesday 10/04 COURTYARD 8-11pm DaDi etro (live) 11pm-1am Luwei Thursday 11/04 COURTYARD 8-11pm Velasco 11pm-1am Rishi Dissidance LOUNGE 11pm-1am go-Dratta 1-3am Alioscia Bisceglia Friday 12/04 COURTYARD 8-11pm Pablito el drito (RXSTNZ) 11pm-1am Luwei LOUNGE 11pm-12am Ltd Colours (Glome Sound / Circular Jaw / Orbiter-ORBTR) 12-1am DJ Vietnam (FU.ME / Orbiter-ORBTR) 1-3am Think'd (Antistandard Recs / Lounge Squatt / PURE WOOL Garden 1993) Saturday 13/04 COURTYARD 8-11pm Hausmann (AAC.live / Adventures), Hypertone (Antistandard Recs) 11pm-1am Rishi Dissidance LOUNGE 11pm-1am TAGLIABUE 1-2am Protopapa (Eurocrash) 2-3am SocksLove (Eurocrash) The nights are linked with UN-LEARN // RE-LEARN, BASE's investigative exhibition for Design Week. The experiment in deconstructing and reconstructing musical identities continues during the day with the Open Sound Session installation #2 as part of BASE Milano’s UN-LEARN // RE-LEARN exhibition, where the public can enjoy mixing sounds dating back thousands of years with electronic beats and digital bases, demolishing the segregation between traditional and contemporary music, between pop and folk, acoustic and electronic, chamber music and dance, urban and country. The Open Sound Session sounds belong to the Open Sound sonic library, a collection of samples captured during the Lucan explorations conducted by the Open Sound Festival curatorial ensemble: cowbells, electric guitars, bagpipes, cupa-cupa, digital beats and arbëreshë singing. All the sounds are open source, non-proprietary, choral, and collective, generated with self-built instruments and made available online to artists all over the world for remixes or live sessions. The Open Sound Session in Milan is a preview of Open Sound Festival, an advanced experiment in musical cross-pollination, a rave, folk festival and street parade all in one. Coming late summer 2019 to Matera, European Capital of Culture 2019. Info 9 – 14 April Tickets available online at Mailticket. The 5 euro entry fee provides access to the Ventura Future and BASE exhibitions, as well as the evening events throughout Milano Design Week, from 9 - 14 April. Why is there an entry fee? EVERYTHING you always wanted to know about Design Work (but were afraid to ask) A designer’s road to creative fulfilment is strewn with often self-inflicted hurdles, alibis constructed to avoid moving forward with projects, and ideas mulled over for ages, lacking the courage needed to bring them to life. That’s why the BASE Milano portineria, located at the entrance to the ex-Ansaldo complex, will broaden its purview as an information hub by introducing the ‘Design Confession’: a full-on confessional dedicated to design, a place in which to ask all those unanswered questions, confess your “creative strife”, secrets of the trade, (im)possible dreams, regrets, second thoughts, hurdles and alibis. The Design Confession is a place where knowledge, techniques, and problem solving (both mystical and practical) get an airing. Just through the grate, ready to offer guidance, are various gurus of Italian and international design. Two confessionals, and three issues to unpack: designers and the market, Service Design and Manufacturing 4.0. When the red light comes on, it's time to 'fess up. - - - DESIGN CONFESSION. THE EXPERTS - - - Patrick Abbattista (DesignWanted), Alessandra Barlassina (Gucki), Alberto Bassi (IUAV / Università di San Marino), Filippo Berto (BertoSalotti), Pietro Corraini (Corraini Edizioni), Chiara Diana (Frog), Maria Cristina Didero (Icon Design), Matteo Ingaramo (POLI.Design), Stefano Maffei (Politecnico di Milano), Stefano Micelli (Ca’ Foscari), Ico Migliore (Migliore+Servetto), Stefano Mirti (Interaction Design Lab), Bilge Nur (Studio Bilge Nur Saltik), Matteo Ragni (Matteo Ragni Design Studio), Italo Rota (Studio Italo Rota & Partners), Laura Traldi (designatlarge), Jasper Udink ten Cate (Creative Chef), Francesco Zurlo (Politecnico di Milano). - - - DESIGN CONFESSION. THE PROGRAMME - - - Tuesday 9 April 3-4pm: Stefano Mirti / Alessandra Barlassina 4-5pm: Italo Rota / Bilge Nur Wednesday 10 April 3-4pm: Stefano Maffei / Chiara Diana 4-5pm: Laura Traldi Thursday 11 April 3-4pm: Francesco Zurlo 4-5pm: Patrick Abbattista Friday 12 April 3-4pm: Filippo Berto / Pietro Corraini 4-5pm: StudentDesign / Enrico Bassi Saturday 13 April 3-4pm: Matteo Ragni / Maria Cristina Didero 4-5pm: Patrick Abbattista / Alberto Bassi Sunday 14 April 4-5pm: Ico Migliore You can book your confession, selecting your "confessor" and the time slot, by emailing redazione@base.milano.it (subject: Design Confession - specify day and time). It's free to take part while slots last. The project, created in collaboration with Ventura Projects, was launched with the aim of establishing a path dedicated to the new culture of learning in order to gather information and know-how capable of responding to the requirements and changes of the creative sector. The confessionals were built by officinaBASE in collaboration with the graphics workshop at Super - Scuola Superiore d’Arti Applicate del Castello Sforzesco. Setting aside room for discussion and debate is our Public Program of talks and workshops, designed to delve into the issues raised by UN-LEARN / RE-LEARN, the exhibition produced by BASE Milano for Design Week 2019. A roster of events created to foster discussion and allow ideas to settle. Tuesday 9 April, 6-7pm OPEN SOUND WORKSHOP A guide to using a sampler, with sound engineer Marco Giordano. The samples available to play with come courtesy of the Open Sound audio library and were collected in Lucania: cowbells, electric guitars, bagpipes, cupa-cupa, and arbëreshë singing, ready to mix with electronic bases in the spirit of Open Sound Festival. All the sounds are open source, non-proprietary, choral and collective, generated with self-built instruments and made available online to artists from all over the world for remixes or live sessions. Wednesday 10 April, 6-7pm WORKSHOP - "SUPERLOCAL, 0 miles production" with Andrea de Chirico An approach to mapping and a shared reflection on our understanding of the spaces that surround us and the materials they are made of, as well as ways to encourage involvement and promote a new mentality around craftsmanship and production in general. After completing the mapping of the buildings and materials found in the local area - the Tortona district - a group of 10 people will spend an hour gathered around a map of the area, identifying places of note. 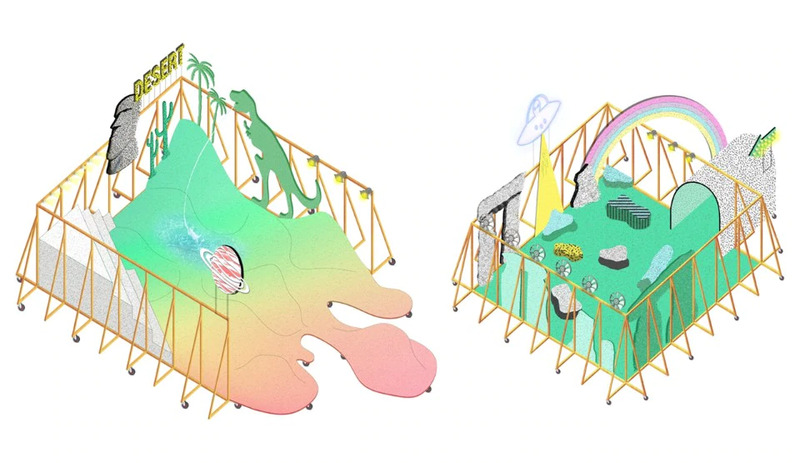 Thursday 11 April, 6-7pm TALK - "Spatial exercises" with Parasite 2.0 A talk exploring a series of experiments undertaken over the years, using spatial exercise and the possibility of temporarily transforming places as a learning process. Can the act of altering the habitat through collective action turn into an exercise in learning how to deal with complex relational systems between individuals? By exploring a few experiments carried out by Parasite 2.0 in recent years, the collective will set out to talk through and reconstruct an itinerary that blends artistic, design and educational practices. Friday 12 April, 6-7pm Build Your WACOM Digital World – DESIGN SKETCHBATTLE Giulio Mosca (artist, illustrator and comic book artist), Matteo Vilardo (Product designer and teacher at IED) and Alessio Tommasetti (architect, designer and concept artist) get into debate in the longest, most crackling hour in the history of Digital Design. The battle field is the giant Wacom Cintiq Pro 32, where the three digital design professionals will challenge each other to a pixel-off. The end result will be a surprise for visitors with the courage to attend. Sunday 14 April, 12-1pm TALK - “un-learn / re-learn / re-act” with Paolo Naldini, Director of Cittadellarte-Fondazione Pistoletto, and journalist Cristina Gabetti The director of Cittadellarte-Fondazione Pistoletto, Paolo Naldini, the students who created the workshop at Cittadellarte, along with communicators, and sustainability experts delve into the question of what we need to learn today. A parliamentary classroom space in which to transform protests into opportunities to provide concrete action and shared propositions for building change. A school studying ways to regenerate every aspect of our way of life and testing these methods in reality. The new Patagonia documentary is about man's arrogance and the devastating costs of fish-farms and nurseries. Premier screening of ARTIFISHAL at BASE Milano. We are keen fishermen and concerned inhabitants of this planet, who see fish-farms and nurseries as part of a worrying trend: a willingness to intentionally ignore science in the pursuit of sheer political convenience. In the evening, Pier Paolo Gibertoni, Ichthyological Vet, Andrea Miccoli, professor of Biology, and Friðleifur Guðmundsson member of the North Atlantic Salmon Fund Iceland, will join us for a question and answer session after the film. All proceeds from the evening will go towards the non-profit association Free Rivers Italia.